Dedicated To Responsible Pit Bull Ownership! 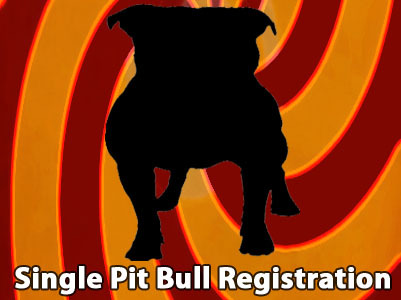 Pit Bull Registration made easy with both mobile and mail in options. Most advanced genealogy tracking in the world with up to 11 Generation Super Pedigrees. Bringing the Pit Bull community closer together around the world. Marketing Assistance. Sell! Buy! Find! Breed! FREE to APBR members. The American Pit Bull Registry specializes exclusively in the registration of purebred Pit Bulls. The American Pit Bull Terrier has a long history and is one of the oldest recognized pure breeds in existence. The APBR believes in the original APBT standard and does not believe in changing a standard to suit the personal interest of bias individuals or to caving in to internal politics of others in the registration industry. The purpose of the APBR is to highlight the positive role the APBT has had in history and to help insure that the breed maintains it's standard and loyalty to owners that it was initially developed for. 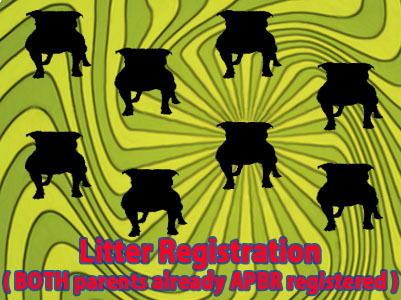 The form IS NOT for APBR litter pup transfers. If you have a pre-registered Pit Bull registered by your breeder from a litter please use the form listed on the back of the certificate provided to you by your breeder. Have a recent LITTER of purebred Pit Bull puppies that need to be registered? Do BOTH PARENTS also need to be registered? If so then this is the right program for you. Here you can register them all together at a discounted rate. Have a recent LITTER of purebred Pit Bull puppies that need to be registered? Does ONE of the PARENTS also need to be registered? If so then this is the right program for you. Here you can register them all together at a discounted rate. 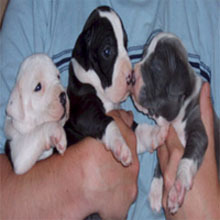 Have a recent LITTER of purebred Pit Bull puppies that need to be registered? 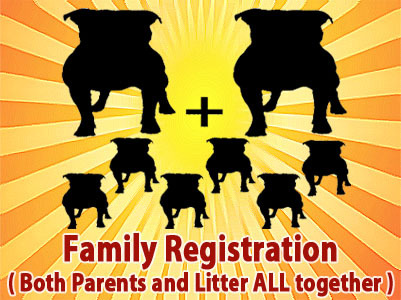 Is ONE OR BOTH PARENTS already APBR registered? If so then this is the right program for you. 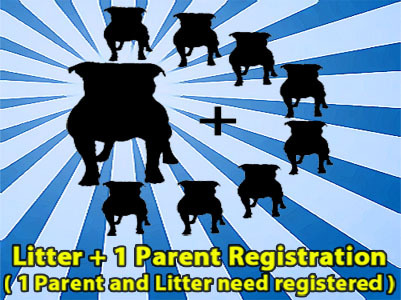 Here you can register your purebred Pit Bull Litter at a discounted rate. Have 5 PUREBRED PIT BULLS you would like to register using a group discounted rate? If so then this is the right program for you. 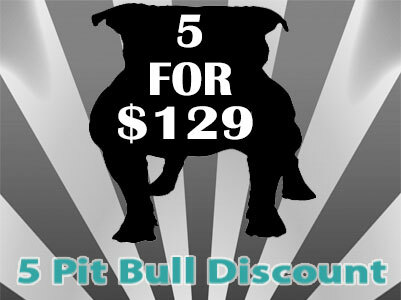 Here you can register your purebred Pit Bulls all together taking advantage of a deep group discount. Plan on breeding? Are you an APBR member or are you signing up to join? 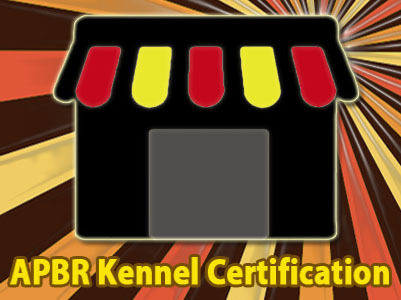 If so then APBR Kennel Certification is RIGHT for you. To be used to register a purebred Pit Bull. Pit Bull LITTER and BOTH parents. Pit Bull LITTER and ONE parent. at a group discounted rate. "Thank you so much for adding me to your site! I already have had three pups sold, and I was only added a week ago! One puppy sold to someone all the way on the other side of the state, five hours away! That would have never happened had you not added a link to my site in the APBR Certified kennel section." If you are looking for a registry to represent you as a Pit Bull owner you have come to the right place. 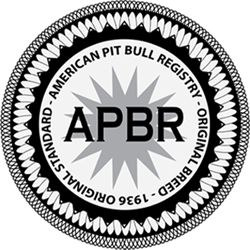 The APBR is the world's largest international Pit Bull specific registry and offers registration services unparalleled in the entire registration industry. In addition to registration services we are also the largest information provider on the world wide web in regards to the American Pit Bull Terrier / APBT dog breed. As part of our service to the Pit Bull community the American Pit Bull Registry ( APBR ) also offers a vast repository of information on Pit Bulls and is considered to be the number one resource and clearinghouse on the Internet with thousands of pages of general and member exclusive content. For those looking to be involved with a live community of other Pit Bull enthusiasts we are also the only registry in the world to maintain a social network ( Pit Bull Social ) dedicated specifically to the breed. While the primary focus of the American Pit Bull Registry ( APBR ) is to register pure bred Pit Bulls, we are a comprehensive resource for the Pit Bull dog breed, owners, rescues, shelters and those wishing to learn more about the American Pit Bull Terrier dog breed and its unique history.